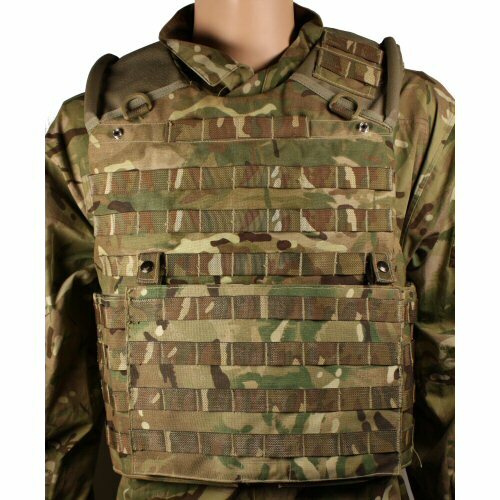 Genuine British Forces issue Ops Panel for Mk4 Osprey Armour vest. The Ops Panel is designed to go over the front of the Osprey vest and cover the velcro panel which holds the sides of the vest onto the front. The Ops Panel is an option to the Osprey accessory pack with its own stock number, NSN 8470-99-925-0872. 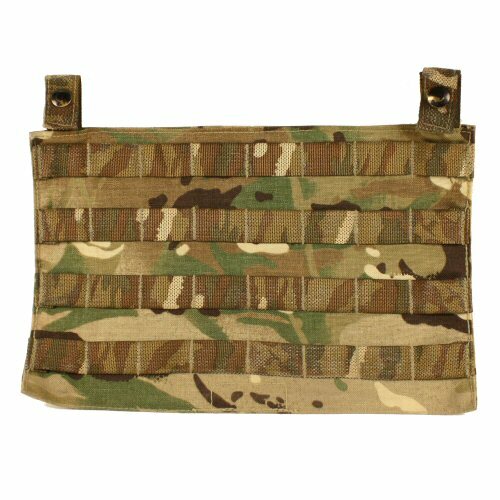 The Ops Panel comes in one size only, and attaches to the vest with two loops of 25mm MTP printed webbing which should be inserted through the appropriate MOLLE loops on the base. The back of the panel is fully faced with hook side velcro to cover the loop side surfaces on the vest base. 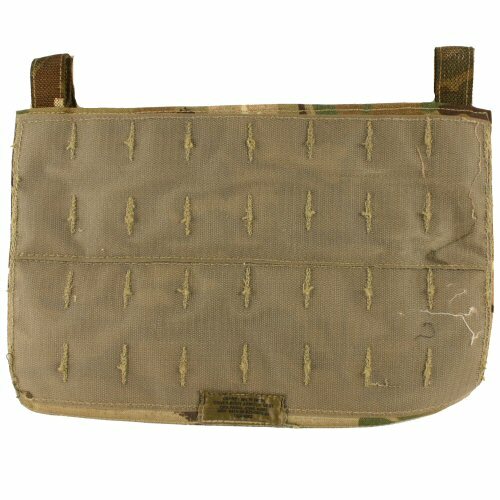 The front of the panel measures 21.5cm tall and 32cm wide, and is faced with alternating 25mm MOLLE webbing straps for attachment of pouches on the front. The front of the panel has 8 loops horizontally over 4 straps which are spaced 25mm apart. The Ops Panel is a lighter alternative to the cummerbund as it does not add weight and material around the sides as well as the front. The sides of the Ops Panel can be fitted with 25mm T-bar keeper sets with adjustable quick release buckles. Fitting these helps to prevent the sides of the ops panel from lifting up if they are carrying a heavy load. Any accessories shown are for display only and are not included with the panel. The rear of the ops panel faced with hook side velcro.